Roger Bennett has made some significant progress on his portion of the public waterfront walkway. Did you know that a public waterfront walkway is being built down at the bottom of Spring Street? Someday it is hoped that you will be able to walk from the ferry landing or Cannery Landing all the way to the port docks along the waterfront. I ran into Roger Bennett over the weekend and saw that he has made some significant progress this year starting construction under his building where The Place restaurant is located. 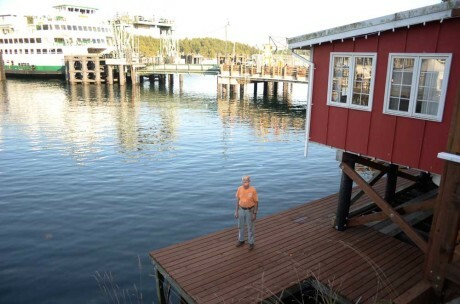 Eventually he says, through a cooperative effort of the Port of Friday Harbor, the Town of Friday Harbor, himself and maybe even the Washington State Ferries, this dream will become a reality. A great bonus if the ferries get in on it, will be that walk-off passengers would be able to get to the other side of off-loading vehicles by going under the ferry dock without interfering with traffic, which could really help reduce the ferry dwell time (the time it takes for a ferry to unload and load while sitting at the dock). And of course there would be the obvious benefit of having a beautiful walkway along the town’s waterfront. What terrific news! Every Canadian waterfront town I visit seems to have a walkway, and I was wondering when this would ever happen here – hooray to those responsible!! Stop by and say hello to Roger. He is working VERY hard to bring this vision to life. You will enjoy the view from the various deck levels and maybe you will be inspired to say “thank you” for all the effort. The walkway will bring new energy to the waterfront and a more attractive entry to our fair town.